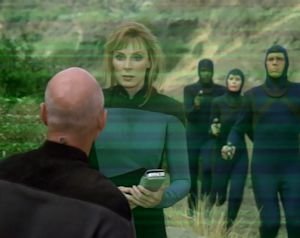 Picard and Crusher are kidnapped and implanted with mind-reading devices. As they make their escape, they discover they can hear the other's thoughts and start to learn new things about each other. I wonder if it's deliberate that the planet "Kesprytt" sounds a lot like the word "disparate." This isn't the first time on the show that either Picard or Crusher have been held captive. It isn't even the first time they've been held captive together, as they were both held by terrorists in "The High Ground," an episode that almost went where this episode starts to go in terms of their relationship. Large-scale pyrotechnics are very difficult on a budget, and CG fire almost never looks good. Given that, the first few fire effects as Crusher and Picard are passing through the lava flow cavern are actually pretty good. The big explosion, not so much. It's always better when the A-story and the B-story are thematically linked, as they are here. Riker is having trouble communicating with the Prytt and getting information out of the paranoid Kes is like pulling teeth. Similarly, Picard and Crusher are dealing with the fact that they haven't been communicating clearly with each other over the last several years. This, then, is an episode about barriers. Crusher's fear of heights is consistent with "Chain of Command, Part I," in which it is first established. I love all the crazy equipment in the Kes' quarters, but I have a hard time seeing how a tesla ball is even remotely useful. Perhaps it's the ambassador's personal decorative touch. Riker's diplomacy skills have gotten a lot better over the years. His success in dealing with both the Kes and the Prytt to get Picard and Crusher back is one of his finest moments. Hey look: an actual, physical barrier. This is an excellent episode that finally puts Picard and Crusher's relationship under a microscope. It teases us with the possibility there could eventually be more--which is why I wish this episode had come much earlier in TNG's run--and it is helped along by some masterful dialogue and genuine chemistry between Gates McFadden and Patrick Stewart. It's also smart in how it approaches the subject matter, using genuine science-fiction as a hook and exploring how two people would react to being forced to listen to each other's thoughts. It's a great allegory for a romance, and it shows us sides of both Crusher and Picard we've never really seen before, though they are consistent with what we know. It's easily the best episode of Season 7 so far, and one of the best episodes for Crusher as a character, who is usually pretty bland and static.